My husband and I bought a house last February on Missionary Ridge, a historic neighborhood in Chattanooga. The first week after moving in, we found a few housewarming gifts left on the porch from neighbors and were offered the usual invitations of “come over for a beer sometime.” One night we came home and found a basket by the back door with homemade brownies and an envelope. My husband handed me the envelope to open. I was expecting the normal, cheerfully printed “Welcome” greeting card, with flowers on the front and a poem inside about the difference between a house and a home. I opened the envelope and pulled out the card, surprised to see a pen and ink macabre sketch on the front that looks like an illustration from a children’s book, but much more sinister. It was an illustration from Edward Gorey’s The Glorious Nosebleed. The inscription inside welcomed us to the neighborhood. It was signed by Tim Reed and Jeanie Holland. Tim and Jeanie are my next door neighbors. Their house was one of the first in the neighborhood, originally a farmhouse built not too long after the Civil War. Walking into their house is like stepping into a folk art museum. There are perfectly curated vignettes everywhere. Tim and Jeanie are both artists themselves, but most of what they have displayed was given to them by friends they’ve met through the years at festivals.. In the entryway, Tim has a cabinet full of vintage toys, mostly dolls. There are various doll parts and things like vintage clapping monkeys, magic 8 balls, wind up animals, a few beanie babies, stuffed Simpson’s characters, and R2D2, and various action figures. Tim reaches in and pulls out a dinosaur head puppet and yells at Jeanie, “Hey look! We already had one of these!” Jeanie has a “Dia de los Muertos” vignette in the living room with sugar skulls, skull candle holders, a skeleton family having dinner in a doll house, and a clay skeleton bride and groom set that she has made. Tim and Jeanie are self-employed and travel to regional art shows and festivals selling their pieces. In fact, that’s how they met. Tim Reed grew up in Tuscaloosa Alabama. Tuscaloosa isn’t a huge town. There wasn’t much going on in the late 60’s besides the university. After high school, Tim found odd jobs working in kitchens and music stores. Tim is a creative at heart, and found like company with a group of friends in the early 70’s who he says “were caught between the Hippie movement and Punks”. They were fascinated with the concept of surrealism, and soon formed an artist troupe called the Raudelunas. The Raudelunas had approximately 20 members mostly music students at University of Alabama. The group would often meet in one of the university’s band rooms, with full access to the equipment and the instruments. Tim played the flute in middle and high school and had the ability to be able to pick up various instruments and play them. The Raudelunas looked for opportunities to perform in the community, and as a way to draw interest to their music, they created bizarre variety skits inspired by Vaudeville shows, a theatrical genre of variety entertainment. Tim developed an alter-ego named Fred Lane. Fred was a singer in the band and the emcee of the shows. He was tasked with telling bad jokes, creating voice- overs, and playing recorded audience applauses during the performances. Tim’s inspiration comes from his environment. Childhood memories of cartoons and old movies, as well as his observation of the bizarre things people say and do, spur his creativity. Tim had other artistic endeavors other than music and variety shows. He had been collecting found objects, painting and piecing them together, and adding in some decoupage. In 1981, he entered his work in an exhibition at the Kentuck Art Center called “Wind Toys, Weathervanes, and Whirligigs.” He had constructed a whirligig out of an old fan. He began making whirligigs embellished with characters he invented. One such character was named “Reet Sputz” and was fashioned after Ted Bowen’s description of the imaginary friend he had when he was 4. 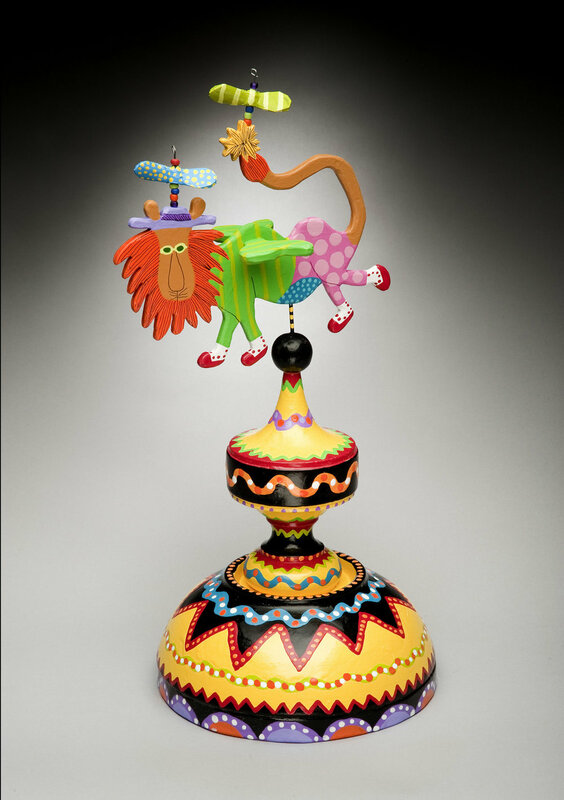 Tim incorporates kinetic movable parts into all of his pieces, even smaller character ornaments. All of Tim’s “creatchers” have names fashioned out of plays on words as well as their own stories. Jeanie Holland is from the Carolinas. She grew up travelling between Charlotte and coastal South Carolina. She comes from what she describes as a family of “linear thinkers” and is the only creative out of the bunch. “I had to be very serious about being responsible and paying my bills on time to justify being an artist to my family,” she says. She thinks that’s one reason why she and Tim are such a good match. They are both creatives, but Tim has more freedom to escape from reality because Jeanie stays grounded and manages the business aspect. Jeanie has always loved stories. Her family never had a television, but relied on storytelling for entertainment. Usually the stories were overheard from her room when the grown-ups were talking at night about crazy family members or the town drunk, but she was also told a lot of stories by her Gullah babysitter, Hattie, who was also a healer. Hattie would threaten Jeanie and her sister with the “Hootie” who would come and get them in their sleep if they weren’t good. Jeanie picked up the Gullah language from Hattie, but was chastised by her parents if she was heard speaking it at home. As she’s telling me about the Hootie myth, she points over to an ominous clay figure on the wall that reminds me of an evil gingerbread man cookie. “Actually… that’s a Hootie I made based on Hattie’s description,” she says. Jeanie took a ceramics class in high school and fell in love with the medium. She planned to attend a ceramics program at college in 1986, but her life took another route and she worked mostly retail jobs in Charlotte. She eventually became an “Alternative Music Specialist” at a family owned company called Record Bar. She was transferred to the company’s Atlanta location in 1989. Jeanie had not touched pottery since high school. She was feeling tired of the retail business, decided to do something for herself, and signed up for a pottery class. She attended pottery classes at Callanwold Fine Art Center in Atlanta for 6 to 8 months before going through their certification program to become an instructor herself. She left her job at the music store in 1991 in order to pursue art full time. She continued teaching at the Callanwold Center for 15 years and also taught a class at the Abernathy Art Center. Jeanie uses a hand building technique for the clay, and a low-fire electric firing method. She does not throw pottery on a wheel. Her first pieces were series of pots that she would carve stories and phrases into. Tim and Jeanie moved to Chattanooga in 2004. She was invited to attend a weekly hooked rug meeting in the neighborhood. She decided that she loved the primitive, folkish designs of the rugs almost as much as she loved pottery. She decided to incorporate the rugs pieces into her art medium by using them as the backdrops for shadow boxes. 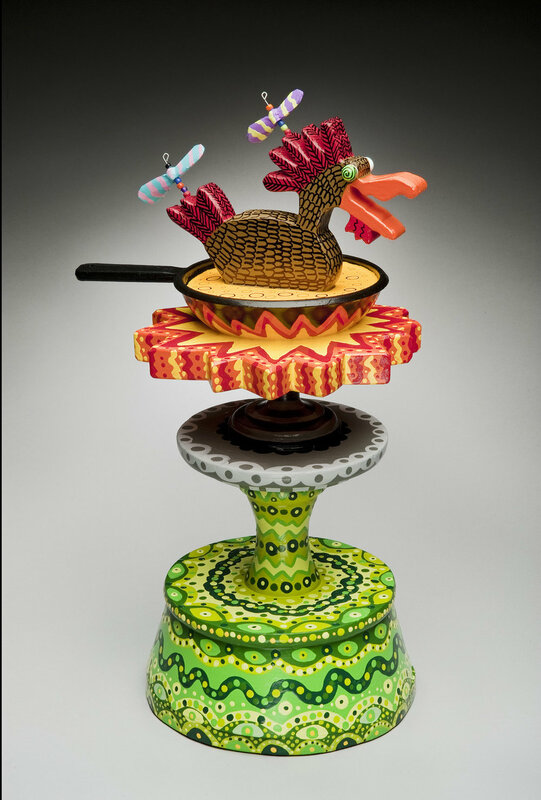 Jeanie mounts clay figures, which are often animals, into the shadow boxes made from cigar boxes, drawers, or handmade frames. In Jeanie’s artist statement, she says “The hooking itself creates a texture which stands up well to the clay.” She is starting to explore ways to incorporate kinetics into her art. She and Tim often discuss ideas for how she can do this. Her pieces have a very folk art feel to them. They are based on primitive children’s toys and are designed to feel like a moment taken from a story. Tim and Jeanie now travel around to festivals and shows together. They have both done commissioned pieces on occasion, but mostly the ideas are their own visions. When I asked how they reconcile the pressure to produce pieces for generating income that they rely on with staying true to their own visions, Jeanie’s response revealed what she thinks art is, and why she really enjoyed teaching. She believes art is fun, that it “grants permission to approach life from a different angle,” and can be a tool for working out problems and emotions. She believes everyone has something artistic about them, and that creating art is satisfying because a student makes something that is “their own.” She and Tim both create pieces in various price points, not only to be able to sell more at festivals, but in order to make art accessible to everyone. Jeanie has smaller clay pieces that are magnets, and Tim has a series of “creachter” ornaments that sell at a lower price point than his larger, table top whirligigs. These days when they aren’t firing clay or painting at home on the ridge, Tim Reed and Jeanie Holland can be found at various regional festivals or the Chattanooga Market. A selection of Tim and Jeanie’s work is displayed on their Facebook page, Odd-creatchter.